Jeep and Mopar have teamed up to create the Wrangler Red Rock Concept vehicle that pays tribute to the Red Rock 4-Wheelers off-road club that hosts the annual Easter Jeep Safari in Moab, Utah. Based on a Wrangler Unlimited Rubicon Hard Rock, the Wrangler Red Rock Concept includes next-generation Dana 44 solid front and rear axles, a Rock-Trac transfer case with a 4.10 axle ratio, a power dome vented hood, new premium off-road rock rails, and front and rear red tow hooks. 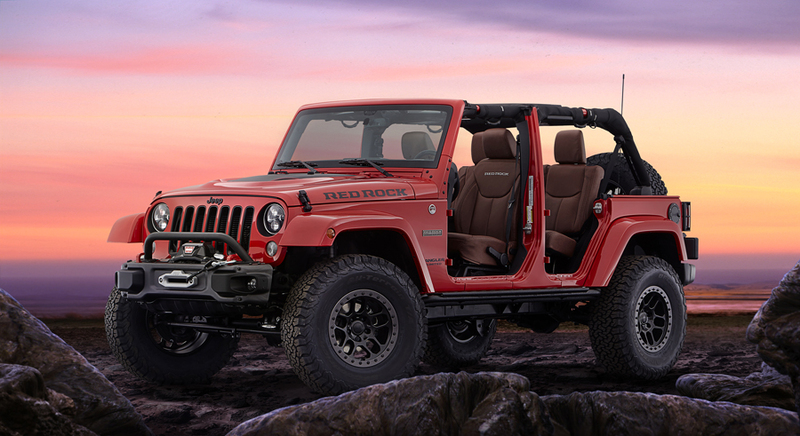 Wrangler Red Rock Concept-specific features include a commemorative Red Rock badge and Red Rock hood decal, low gloss Jeep badge, low gloss Granite Crystal off-road bumpers, and a body-color grille with low-gloss black grille throats and headlamp accents. Inside, Amaretto Brown Katzkin leather seats with silver accented stitching and a “Red Rock” embroidered seat back logo set the Red Rock Concept apart from the rest of the Wrangler lineup. A serialized “Red Rock” grab handle plaque is also featured to commemorate the 50th anniversary of Easter Jeep Safari. The Wrangler Red Rock Concept’s rugged look and off-road capabilities are enhanced with help from a 2-inch lift kit, 17-inch beadlock wheels – in low gloss black; the bead lock rings are low gloss Granite Crystal – wrapped in rugged 35-inch BFG K02 all-terrain tires, LED headlamps and fog lights, and a Jeep-branded CB radio. 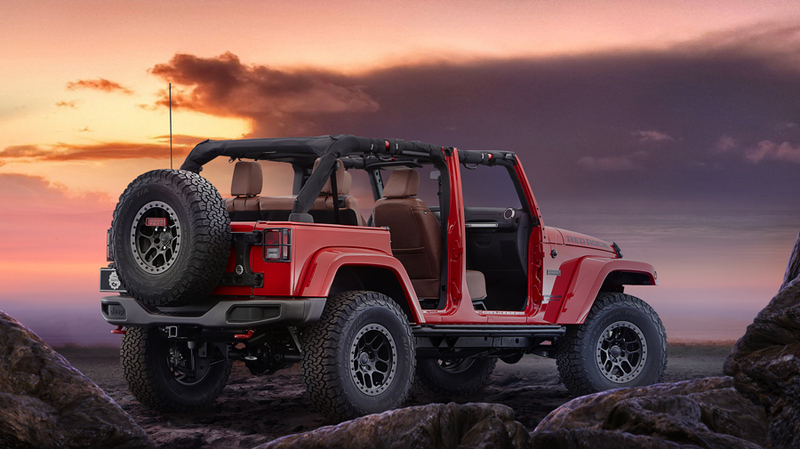 The Wrangler Red Rock Concept includes an aftermarket Warn Rubicon winch, front and rear differential covers, and a reinforced swing gate and wheel mount. The concept vehicle will be showcased at this year’s Specialty Equipment Market Association (SEMA) trade show in Las Vegas. In 2016, Jeep will produce 50 serialized Jeep Wrangler Red Rock special-edition models to celebrate the 50th anniversary of the Easter Jeep Safari.